Part two of a three part series exploring physician retention at The Memorial Hospital in Craig focuses on the administration's role in controlling workflow at their hospital and clinic, compares national statistics regarding physician retention to personal stories from recently-departed doctors, and examines hospital recruitment. Keeping a community’s residents healthy is no easy task. Getting patients in and out and treated correctly depends heavily on resources and available physicians in an area. As doctors depart The Memorial Hospital in Craig harboring some ill feelings, residents are becoming concerned with how they’ll be affected as patients. The following is part two of a three-part series examining the issue of physician retention at TMH — whether what’s happening in Craig stems from the current administration’s role in controlling work flow and recruitment or if it’s part of a national trend — told from the perspective of current and former hospital employees, as well as current administrators. Physicians often talk about the “flow” of a clinic or hospital, how often or how quickly a doctor can visit with patients. Flow can go a long way toward providing opportunities for physician success and contributing to a healthy working environment, which can make up for lower than average salaries. Yarmer’s experience with the recruitment process and control over her patient flow solidified her decision to move her family from Florida to Craig. In addition Yarmer said administrators set up interviews with Moffat County School District Superintendent Joe Petrone so she could find out more about the schools for her children. TMH also helped Yarmer find her home, which she said would have been impossible from thousands of miles away or in the midst of a professional transition. “Probably of all the places I’ve worked this facility has been the most cooperative with me to do what I feel needs to be done, and make sure my patients are taken care of appropriately,” Yarmer said. But Phillips said he felt differently about the ability to control the flow of his patients. What Phillips describes in his letter as the initial “red flag” was his interpretation that the administration refused to consider physician input on staffing decisions at the clinic. “I lost my medical assistant, Cindy Nichols, because of this, which dramatically affected my ability to provide adequate and efficient care to my patients,” Phillips said. Nichols was crucial in assuring prescriptions were called in accurately and timely, that imaging and lab results didn’t fall through the cracks, and patient flow in the clinic was maintained, Phillips said. “The administration wasn’t just causing some employee to leave, they were interfering with my ability to effectively care for my patients,” Phillips said. Womble on the other hand, said his experience with patient flow was more in line with Yarmer’s. “Surgery is important (because) patients really don’t want to be here,” Womble said. “They want to spend as little time here as possible. Bryan Chalmers, chief financial officer for TMH, cited statistics from the book “Owning Medical Practices,” by Marc D. Halley, MBA, published in 2011 in which a study examined turnover rates among younger primary care physicians, 45 years of age and younger, who had been in practice between two and nine years. It found over a five-year period, 55 percent of physicians in the study left the practice where they were employed. It also found 20 percent of physicians in the same study group left two employers in the first five years. Jennifer Riley, chief of organizational excellence at TMH, said she thinks it’s not uncommon for a physician to leave their first job — just as it’s not uncommon for any professional to leave their first job — adding it’s more unusual for a young professional to stay 20-plus years. 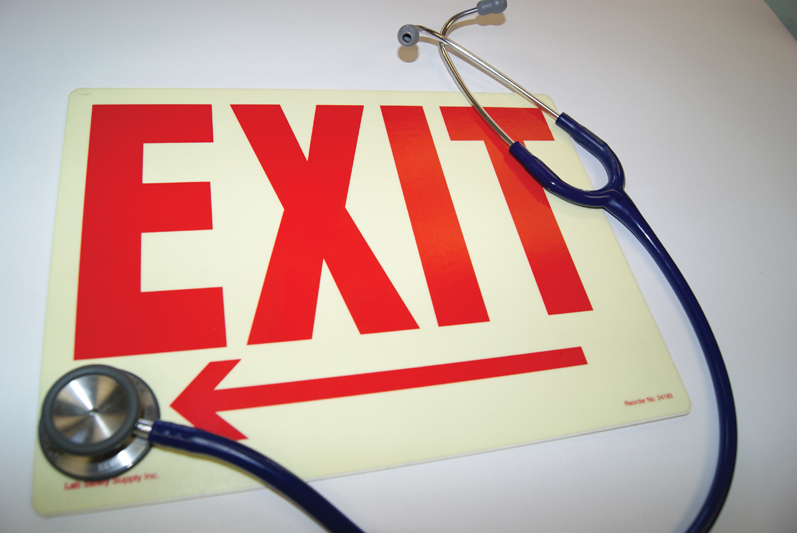 But physicians like Phillips, former contract anesthesiologist Tammy Rice and Dr. Stan Pense, another doctor who recently left TMH, challenge that assertion, saying their departures cannot be attributed to statistics. “Craig was our home for almost 14 years, the OR crew was — and still is — like family to me, my husband had an established business, and my kids had close friends as it was the only home they knew,” Rice said. Though recruitment may seem like a difficult task to some, Rohrich said the community doesn’t need to worry about attracting doctors. Looking back five years when recruitment first began for the new hospital, Riley said the response was nowhere close to that. One or two applicants were more common, Rohrich added. The administration has been planning on recruiting ever since they began campaigning for the hospital five years ago, Riley said. “We knew it was critical to have a new hospital in order to bring new physicians to the community,” Riley said. “George said that from the outset. It’s a recruiting tool. And they did, Riley said, despite doubt among community members at the time that the hospital would positively impact the local medical community. In fact, Riley was excited to say TMH has three new physicians arriving within the next eight weeks. “We’re focusing on what we do have coming because it’s exciting,” Riley said. “This is an exciting time. But Pense disagrees. He said letting doctors like Rice leave was a big mistake on the administration’s part. “Anesthesiologists are hard to come by in rural America and now we just have nurses,” Pense said. Rice said she felt Rohrich saw no problem replacing her, an MD anesthesiologist, with a nurse anesthetist. But doctors like Ellis said he was amazed with the response to open positions as well, and saw no issue with recruiting doctors.